In my Bible study this morning, I was led to sing a hymn. It was Amazing Grace. The last few months have been a bit of a challenge in one particular area of my life—we all have those times, don’t we? …thing is, it’s been an unexpected area, with predictable yet unexpected antagonism. I have standards—we all do—and those standards have suffered repeated violations which continue to interrupt the productivity of my time, my heart, my vision, my experience and even my ethics. I’m being vague, I know. Please extend a bit of grace to me for my intentionality. There are others involved, and some caring discretion is needed. Grace has been what has brought me through them in the past, oh so many times… Grace is what will bring me through them now. The book from which I was reading also recommended reading Romans 5:1–5. Well…that was a completely awe-filled thing to suggest! Do you see the AWEsomeness of His Word? Oh, it is simply incredible! Each day is a new day, and I needed to sing out those words this morning, and I needed to be directed to read some of my favorite hope-filled verses this morning. My Heavenly Father and my incredible Savior knew what I needed, and with an open Book, a voice and a precious Word, my cup was filled. My daily bread was gathered. The table was set before me. I am grateful to always find hope in His amazing grace. How many of us woke up this morning to proclaim, “HE IS RISEN, INDEED!”? A lot of us DID do that yesterday, but did we do it today? Yesterday was a day where, upon waking, I’m sure we thought about the sacrifice He made and the glory of His resurrection. We went to church and thought about it some more. We took the time to celebrate that He is no longer on the cross, and He’s no longer in the tomb. 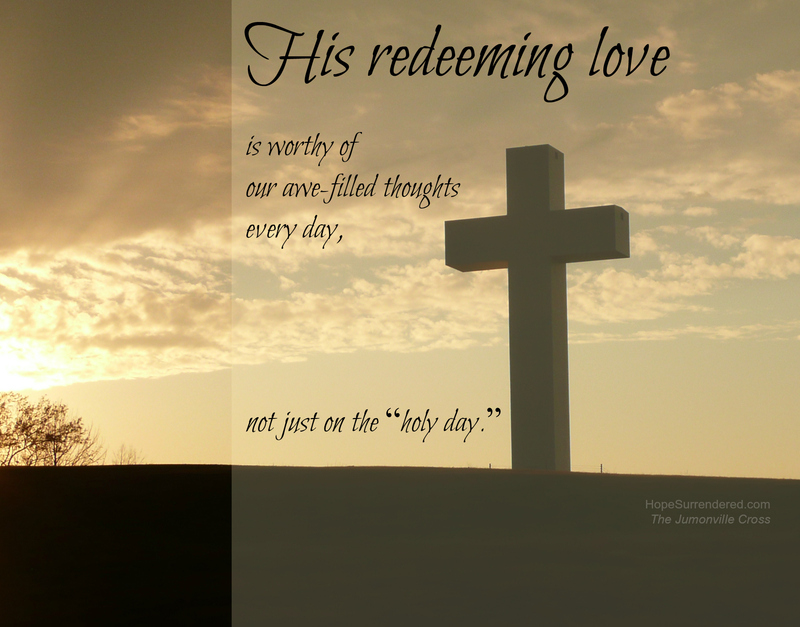 The story of His redeeming love is absolutely awesome and awe-inspiring. it is awe-inspiring EVERY SINGLE DAY. For over 2000 years, it’s been awe-inspiring, and that won’t end. What He did then was just as amazing as it is today. Yesterday’s proclamation is today’s proclamation, and it will also be tomorrow’s proclamation. Before your feet hit the floor tomorrow morning, take a moment to revel in His love. Think about what His resurrection means to your eternity. Think about what His resurrection means to your life. When your feet hit the floor, allow the awe of redemption to make a path for your day. Monday’s Musings — He’s AWESOME! Did you know that God is described as “awesome” in the Bible? Yes, the actual word is used. I’ve read these passages before, but–obviously–I had not read them slow enough or conscientiously enough to see the word “awesome” in the way I do now. (I need to work on having “eyes to see” and “ears to hear.”) That particular word takes me back 30+ years to my teens. “Awesome,” in my mind, was more of a teeny-bopper word…until last week. During the ’80s, I don’t think I EVER attributed “awesome” to God. 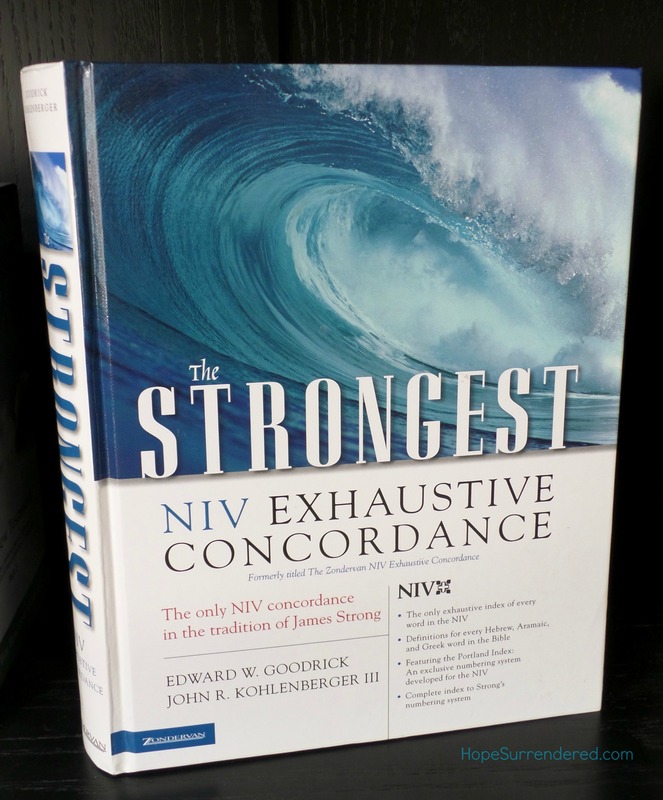 I use a New International Version (NIV’84) of the Bible for my regular study, and my exhaustive concordance is the same version. It lists “awesome” as being used 34 times in the NIV Bible. For comparison’s sake, the New King James Version (NKJV) uses “awesome” 39 times, the New American Standard Bible (NASB) uses it 32 times, and the English Standard Version (ESV) references “awesome” 33 times. As a part of my homework for this post, I committed to read all 34 entries from the NIV. I knew and I know God is awesome, but after reading these 34 references to the word in the Word, I AM just IN AWE of who He is and how my still-’80s perspective of “awesome” falls SO far short of the real meaning of the word. If you go to Blue Letter Bible , and you type in “awesome” and ask to see it in various versions (I pulled it up in the NASB for this particular example), and then you click the box beside STRONG’S (you can only do that on the NASB and the King James Version on this website; that’s why I used NASB…), you’ll see the word “awesome” come up in red. Just to the right of the word, you’ll see a tiny reference number. If you right-click this and open it in a new tab, you’ll see the same page I linked to above and here. My takeaway — from the verse in Nehemiah we were going over last week and also after reading the 34 NIV references — brings me to seeing God in an even more astonishing and reverent, awe-filled way! He’s majestic, all-powerful, all-knowing, all-present, and…AWESOME! I knew all of that, but I never deeply tied who He was to the Biblical definition and understanding of “awesome” like I do now. My ’80s idea of the word just can’t match how I see it now. I just love reading His Word. He never ceases to amaze me. Never. He knows me SO well, and even after many years of studying Him in His Word, I still get excited to learn more about Him…and also about words which describe Him.